Hoover Fence The Cadence, Arched 4'-6' H x 16' W Vinyl Double Gate Kit, Steel Frame | Hoover Fence Co.
PVC Gates are reversible to arch up to center, or down towards center of gate opening. Structural galvanized steel gate frame allows for wider gates. Gates perfect for use in commercial, or residential applications. Gates may be installed in single swing or double swing configurations. Kits offered here are double gates. Perfect for restaurant dumpster enclosures! Aluminum welded gate frames (2" square) and aluminum gate posts (6" square) also available at an approximate 15% increase in price. Contact us for a custom quote. Constructed of premium 1-5/8" O.D. galvanized tubing HF40 & HF20. Frames made from round tubing. Notched and/ or hammered steel joints. Gate frames welded after galvanizing. Welded joints painted with welder's paint after welding. Steel frame bracing may vary by style, size, height, and width. Pictures are representative only of particular project. Galvanized frame visible on inside of gate. Diagonal truss rod welded to help prevent gate sag on some sizes/ styles. Galvanized bolts used for fastening wood. 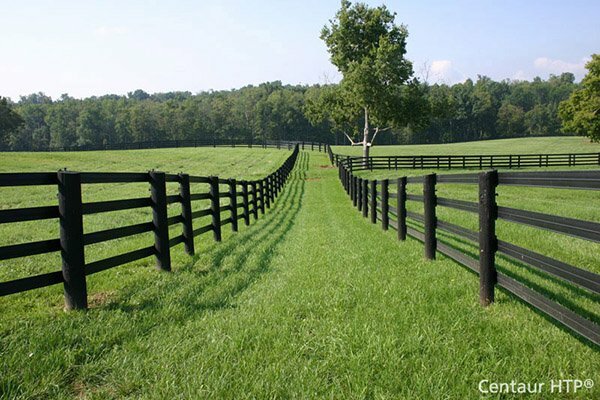 Available in nearly any style of vinyl fence and wood fence! Available in white vinyl as priced. Tan is also an option at a small color surcharge. Gates match perfectly our Bufftech New Lexington style of fence.